Azura Benguerra Island is a tropical island paradise from the story books of history. Silver beaches, leaning palm trees singing in the gentle breeze and the endless cerulean Indian Ocean dishing largesse in the form of tranquillity, delicious fresh seafood and marine abundance. Benguerra is peace, seclusion, Mozambican hospitality, lavish opulence and modern efficiency at the gentle pace of the Indian Ocean islands. The three types of beach villa at Benguerra all offer sensual island grandeur. Each villa blends perfectly into the indigenous gardens which,in turn meld into the verdant Indian Ocean vegetation, the dunes and finally the sea. Each magnificent villa is just a few steps from the beach. Inside, the locally-sourced wooden beams support thick roves of fragrant jekka which provide respite from the island sun, the cool air inside touched with a sense of marine wilderness. The décor is contemporary coastal African – simple, aqua-marine, light, spacious and airy but gently refined. The largest villas are the Infinity Beach Villas which boast private 5 metre swimming pools that extend onto the beach. All villas have secluded beach salas where you can relax on the sumptuous day beds, an island cocktail next to you, the Indian Ocean breeze cooling and healing you weary spirit. The private covered decks and lounges are ideal places to dine in sophisticated seclusion or laze with a great book, the cobalt sea singing you to gentle repose. These spectacular private beach homes are furnished with king-size beds, down duvets while the commodious bathrooms vaunt indoor and outdoor showers and vast bath tubs for ultimate relaxation. You may be lucky enough to experience the power and majesty of an Indian Ocean storm from the seclusion and safety of your bed – the thunderheads turning the sky gun-metal and the sea to slate before clearing to reveal a night firmament of a billion African stars. Villa Amizade, decorated and appointed in the same exquisite style as the Beach Villas, is a two suite villa ideal for families and small groups. This expansive family retreat offers a generous private pool set on a deck fringed by a private beach and looking out west to where the sun sets over mighty Africa. The expansive lounge area is fully equipped for families (TV, DVD, games etc) while the wine bar offers parents a space to sample some of the wines brought over by the owner from his personal chateau in the Loire Valley, France. The Presidential Villa is possibly the most intimate, secluded and flamboyant beach house on the Indian Ocean. The three en-suite bedrooms, lounges and wine bar are the acme of Indian Ocean elegance and African luxury. Away from the main house, there are two private beach salas and a magnificent tree house where you can doze or absorb the atmosphere of the gentle waters as they stretch to Bazaruto Island and then into infinity. Benguerra Island the ultimate space recline in luxury and rejuvenate but there is also a huge amount fun to be had. There is a magnificent two kilometre reef for snorkelling in the crystal warm water while the colours of the life below astonish. If you’d like to go deeper under the water, scuba diving is magnificent and the five-star Benguerra dive centre is equipped with all the best equipment and expert instruction for novice divers. The fly-fishing from the shore is a gentle way to spend a few hours while the tag and release game fishing – for marlin, sail fish, tuna and giant trevally – is some of the best in the world. If you prefer to stay above the surface, boat trips into the Indian Ocean vastness to look for whales, dolphins and, if you are really lucky, the dugong feeding on the sea grass, will leave you with a deep sense of awe and contentment. For lunch, you could picnic on a deserted sand bank at lowtide – your personal Indian Ocean restaurant disappearing with the rising tide. 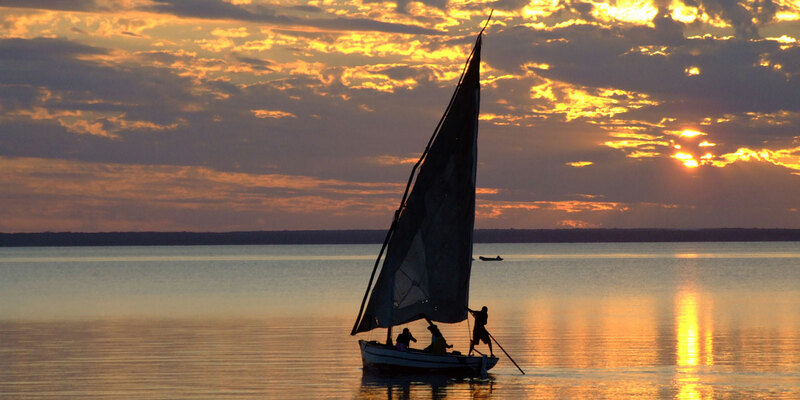 At the end of an exciting day, there is surely no better way to appreciate the astonishing life on the ocean than from a colourful African dhow, the calm ocean lapping against the wooden hull, the sun disappearing over the wonder of Africa to the west. The Azura African Spa at Benguerra is wonderment in itself where you can treat yourself to unique Butter-me-up wrap that uses a secret recipe of oils from the mongongo nut and the marula. The tranquillity of a massage or facial while luxuriating in the magnificent seclusion of the Indian Ocean will disperse any residual stress. All guests to Benguerra are treated to a personalised butler service by our Mozambican staff – renowned for their friendliness and desire to please. The nearest airport to Benguerra is Vilanculos which in turn is a ten minute helicopter hop over the calm waters of the Indian Ocean. There are daily 1.5 hour flights from Johannesburg OR Tambo International Airport to Vilanculos. Alternatively, if you have been on safari in the Kruger area, there are convenient flights into Vilanculos twice a week (Thursday and Sunday) from Kruger Mpumalanga International Airport. There are simple and quick customs procedures at both charming and modern airports. Southern Africa is a land of beauty and majesty. Iconic Africa suggests that you combine your secluded island retreat with a safari in the epic greater Kruger National Park or the malaria free Madikwe game reserve. Cosmopolitan Cape Town – with its natural wonders, gourmet restaurants and boutique luxury is an excellent option for families and romantic couples. If it’s natural wonderment and adventure you want then the Victoria Falls and its epic surroundings will fulfil every possible expectation. Contact one of Iconic Africa’s passionate southern Africa experts to design the bespoke African holiday of your wildest dreams. Benguerra Island is the stuff of storybook legend – white beaches, palm trees, balmy cobalt water and utter privacy in the lap of simple sophistication, complete luxury and Mozambican hospitality. Contact Iconic Africa now so that we can place you in this retreat of rejuvenation and splendour. Silver beaches, cobalt blue ocean and palms singing gently in the breeze. Lavish opulence and modern efficiency at a gentle island pace. Each villa blends perfectly into the indigenous gardens. 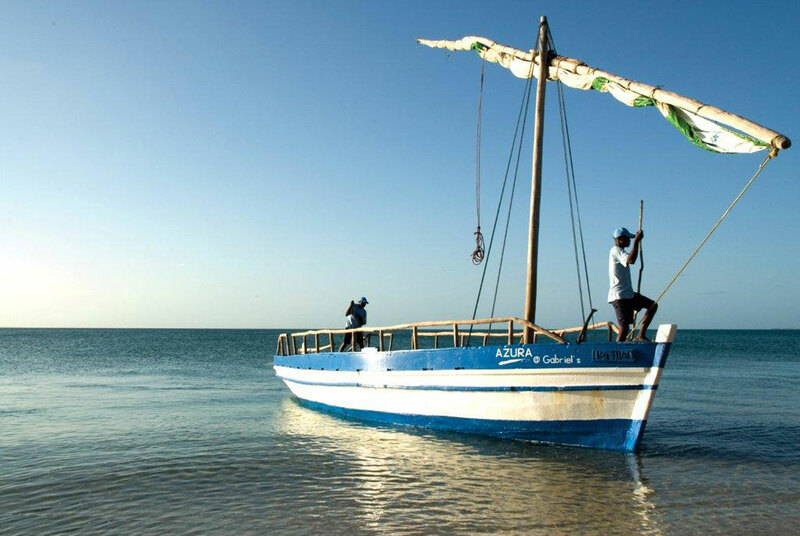 Mozambique has an exquisite warm and tropical climate, which makes it a wonderful beach holiday destination. Here’s a little more of the magic that awaits you in each season! Summer falls between October and April and this is when the weather is at its most tropical. It is can be rainy, humid, and very hot! Take care to wear lots of sunscreen over this period. The winter months May to September is thought to be the best time to visit as temperatures are much cooler and there is little to no rain. Due to the tropical climate this provides the most enjoyable weather conditions, clear skies and lots of bright African sunshine! Azura Benguerra is an Indian Ocean tropical paradise we all try our best envision! 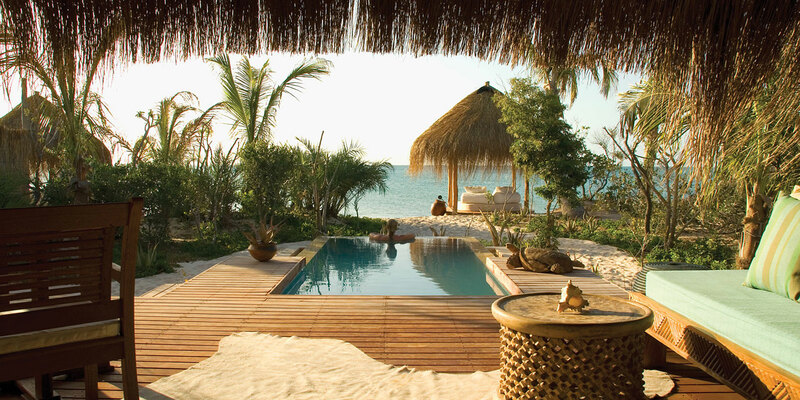 A luxurious heaven in the shelter of the Mozambiquean islands. No romantic trip to Africa is complete without a visit to this lavish retreat and ideally should be combined with a magnificent safari experience. Simply contact one of our African travel experts and let us tailor make your journey to this and other majestic African destinations! La Residence opened its doors in 2008 and as a flagship property of the illustrious Biden family-owned Royal Portfolio, has been embracing and astounding guests with an unparalleled level of luxury ever since. Nestled into the side of Signal Hill and boasting some of Cape Town’s most spectacular views lies a magnificent Cape Edwardian mansion that will welcome you with both arms and capture your heart forever. Ellerman House not only offers the ultimate in Cape luxury but it is an endless heaven to wine lovers and art fanatics alike.